Topi, a mobile event networking app that wants to help you find the right people to talk to at large conferences, today announced that it has launched a nifty integration with Meetup. The new feature will allow that site’s members to more easily find each other at events and stay in touch even after the event ends or at other events in the future. Topi also now uses geofencing to allow meetup attendees to connect with each other as long as they are in the same venue. The app is available for iOS and Android devices. As Topi co-founder and CEO David Aubespin told me earlier today, all Meetup organizers will be able to use the tool for free for their events. While this isn’t an official partnership with Meetup — Topi just uses their public API — he believes that this new feature will make meetups more interesting as it creates a layer on top of these events that persists after they end. If you are a member of the New York Tech Meetup, for example, where Topi is showing these features for the first time today, and you go to another event later, the tool will show you who else from the earlier meetup is around. 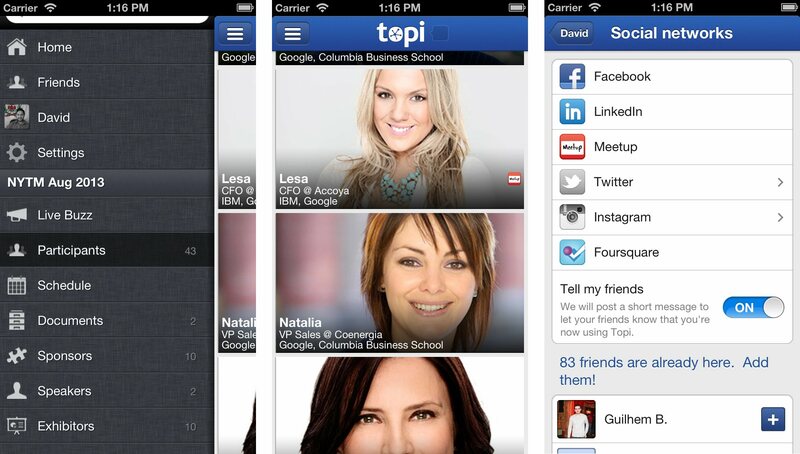 In addition to the meetup integration, Topi is also extending its use of Twitter, Facebook and LinkedIn in its app today. LinkedIn, for example, is now integrated in Topi’s PeopleRank algorithm, “so attendees gain even better insight into recommendations of people they might know and who they should be meeting.” PeopleRank, Aubespin told me, gets significantly smarter because of this integration, and the service is now able to suggest chat rooms based on where you previously worked or what industry you were in. This, the Topi team believes, will allow participants to break the ice more easily and start making connections at large business events. Topi also now supports Facebook events, so that it can group users into Topi chat rooms accordingly and allow you to connect with users at the event before, during and after. Its Twitter integration allows you to view all tweets tagged with an official event hashtag and to tweet from the app with the hashtag. For Topi, the idea is to work with event organizers (and potentially charge them) to provide the official app for their events. Event organizers can, for example, include their schedules, links to sponsors, exhibitors and document downloads to their events on Topi. For Meetup organizers, though, Aubespin told me, the service will always be available for free.